Austin's Funky Chicken Coop Tour is back for an 8th year and this time we've really got something to crow about! The purpose of this tour is to encourage city residents to raise chickens at home by demonstrating the many ways that chicken (and other poultry) housing can be incorporated into urban residence without violating city ordinances or creating a nuisance. Our theme this year is Chickens as Zero Waste Heroes. Join the Austin and Central Texas Backyard Poultry Meetup for your chicken questions and to meet fellow feathered friend supporters. Bring a finger food to share with the peeps. See you there! Ready for a spring picnic on an organic farm? Do you wonder about all those chickens that produce your "Jeremiah Cunningham's World's Best Eggs"? If you've never seen a 100% organic free range chicken operation, and would like to tour the actual feed mill that produces Coyote Creek Organic Feed, then mark your calendars for the Coyote Creek Spring Tour! * Do you own chickens but are not interested in having your coop on the Funky Chicken Coop tour? * Do you like chickens and want to spend some time with others of a similar interest? * Do you want to help spread the word about the benefits and joys of raising chickens? * Do you like to bicycle and want to help make this year's Tour de Funky Chickens a success? If so, there are some wonderful opportunities for you to help prior to the tour, on the tour day itself, and after the tour is over. The Funky Chicken Coop Tour®, founded in 2009, is an annual self guided tour held each spring on the Saturday of Easter weekend in Austin, Texas, by the 501 (c)(3) nonprofit organization the Urban Poultry Association of Texas, Inc. The purpose of this tour is to encourage city residents to raise chickens at home by demonstrating the many ways that chicken (and other poultry) housing can be incorporated into urban residence without violating city ordinances or creating a nuisance. Callahan’s General Store will be hosting a kick off event for Austin’s fourth annual Funky Chicken Coop Tour. The Alamo Drafthouse Rolling Roadshow will provide a special screening of Mad City Chickens at 7:00 PM. Mad City Chickens is a sometimes serious, sometimes whimsical look at the people who keep urban chickens in their backyards. 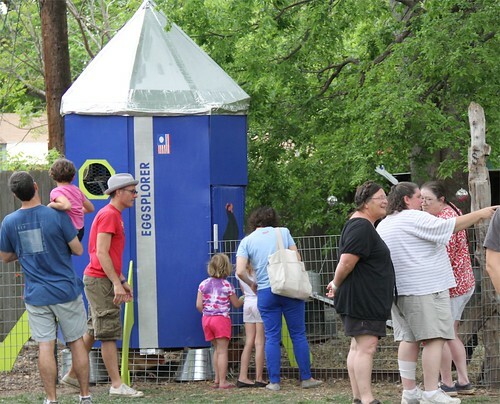 On Saturday, April 7, 2012, Austin-area poultry keepers will open their backyards to the public for the fourth year in a row to show off their chickens and their urban coops. Visitors to the tour sites will see how recycled materials can be transformed into a low-cost coop or how a design-conscious coop can enhance the beauty of a landscape. The tour hosts will be on hand to share their experiences with chicken care, coop design, maintaining harmony among the chickens, people and other pets, and more. The Funky Chicken Coop Tour® is looking for backyard poultry enthusiasts to open up their backyards and show off their coops for the 4th annual event being held Saturday, April 7, 2012. The self-guided tour will run from 10:00 a.m. to 4:00 p.m, rain or shine. If you are interested in showing your coop, volunteering or being a sponsor for the tour, visit our website, www.austincooptour.org, and complete your application today. Coop Host Application Deadline: January 22, 2012.